We have a charming Bush Hut on our working cattle property on Christmas Creek. 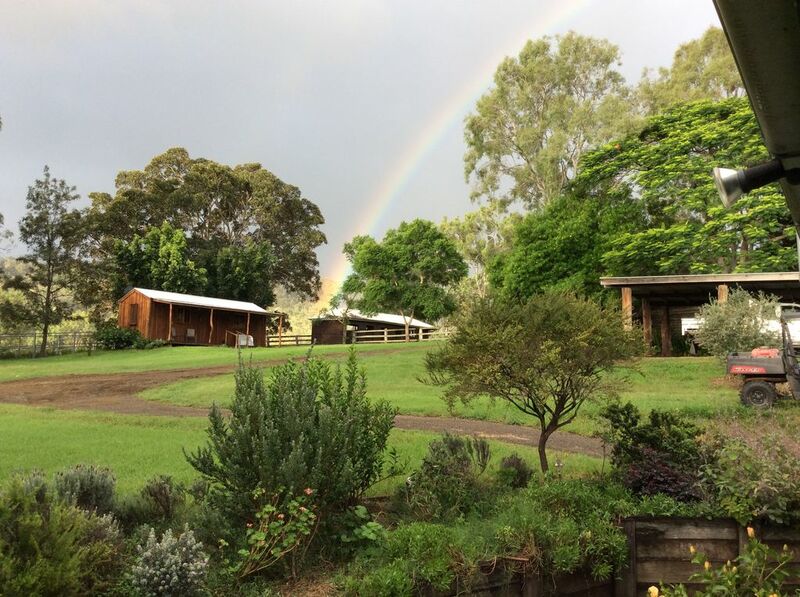 Come and enjoy the quiet of the bush while you sit and relax around a camp fire or have a swim and a picnic by our swimming hole in pristine Christmas Creek. The hut is air-conditioned, fully self contained with a bedroom, sitting room, kitchen and bathroom - it is three years old and made from ironbark slabs. You are welcome to explore the 300 acre property and meet our quiet herd of cattle. An iron bark slab hut with all amenities for a comfortable relaxing getaway on our working cattle grazing property. We have an outdoor fireplace with barbecue plates for you to sit out and enjoy dinner under the stars. No smoking in the hut please. A wonderful escape to the country.. The Farm Hut was a wonderful escape for my wife and I with two small kids. We loved the cosy cottage, sitting around the warm campfire and going for walks on the property down to the creek. My 3 year old son loved riding in the tractor and buggies and helping feed the cattle. Claire and Rod were just lovely and we were very grateful for their hospitality. I would strongly recommend the Farm Hut to any couple or any small family - a true escape. We hope to be back.. Such a lovely little get away peace and serenity - beautiful photogenic shack done up and preserved beautifully! A great spot for a fire out the back and wonderful location close proximity to some wonderful hidden gems - waterholes and walks! We spent one night at the Farm Hut and loved every second. We took our own food and didn't leave (only once to explore Christmas Creek). It rained majority of the time we were there and it was so cosy to curl up in the cosy space with a glass of wine and listen to the rain on the roof with no other distractions or noise. Highly recommend this and can't wait to be back. My Husband and I stayed at the Farm Hut-Peaceful Getaway over the weekend. Thank you to Both Claire and Rod for a wonderful tranquil getaway. The Farm Hut was very comfortable and very cute. We will definitely be Back again. Amazing hosts that went above and beyond to make our stay peaceful and enjoyable! Beautiful home with a beautiful property owned by beautiful people! So glad you enjoyed your stay in our cottage in this beautiful mountain area. Come again anytime - you were great guests. Great place to relax and unwind around an open fire or down by our pristine creek. Swim in one of our private swimming holes, walk or fish in our 1.5 km of Christmas Creek. Several National Park are just a few kms away with lots of opportunity to explore the area.